In process of releasing a new version for Paradox. There have been numerous graphical improvements and new functionality such as being able to walk on certain walls. The new release will come out once a the lighting bugs have been addressed. The next version of Paradox will have new and improved floor, wall and UI textures along with a new teleporter for ending the level. 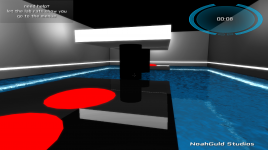 Players are now able to manipulate gravity by walking on walls that through a combination of keystrokes reverse gravity. Users are able to carry objects onto walls, release them using the gravity local to the player or opposite to that of the player. 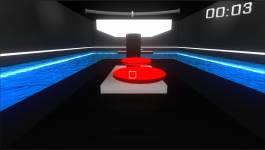 the next release will have levels which make use of the players ability to manipulate gravity. The GUI system has been replace. With an entirely new HUD and new menu, the GUI is cleaner, simple and curved. As can be seen in the comparison below, the new HUD provides a less distracting time meter. As well there is a new teleporter which was designed to resemble an end of a wormhole. Currently it provides the rippling/reflective surface with a view resulting from transparency but will soon allow the player to look through it into the next level. The hold up on the new version currently is lighting. Currently the light casts solid rings along the walls as the the color gradient changes farther from the source. Once this issue is fixed, the new version will be released.